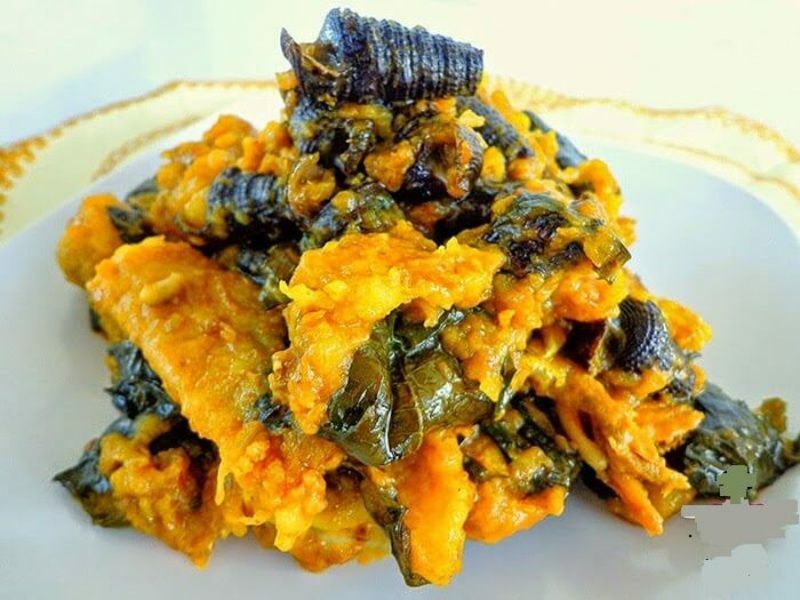 Ekpang Nkukwo is one of the native meals of the Efiks and Ibibios. This tasty and mouth-watering delicacy is made from several ingredients having coco-yam and a little water-yam as the base. You might actually ask how this meal gives you a balanced diet. But to shock you, Ekpang Nkukwo is the “in-thing” when it comes to balanced diet because you are exposed to carbohydrates, proteins, vitamins, minerals, and oil from the seafood, cocoyam, and the green leaves. This is one of Nigerian dishes that can be exhausting to prepare from the scratch, but trust me life would just be easy if you could grate a lot of cocoyams, divide into zip locks and dress the shrimps and other ingredients in advance. Chop off the sharp end of the periwinkle to give ease when sucking, and then wash severally to remove the dirt and sand. Line your pot with some of the periwinkles and season with salt, pepper and 2 seasoning cubes to taste. Get one of the leaves and spread the grated mixture over the surface, roll up till the edges of the cocoyam are sticking out on both ends of the leaves and place within the oiled pot. Repeat the process till the mixture is used up. Pour in the hot water slowly around the edges and still leave on low heat for 10 minutes. Pour in the rest of the periwinkles, add the Crushed seasoning cubes, pepper, crayfish, palm oil, pour in stock with Dry fish, Ponmo, Beef, Stockfish, Crayfish, Shrimps, and Snail included. Please at this point do not stir your pot else you would have a potty when done. Increase the temperature to medium heat and pour in 2 cups of water as your pottage cooks for 20 minutes on medium heat with a covered pot. Stir your pottage gently at this point and reduce to low heat. Pour in palm oil and add the scented leaf, stir in and leave to simmer for another 5 minutes on low heat. Ekpang nkukwo ready to be served hot.